Like the subjects says, I installed the Markdown plugin, but I can't see the preview tab. If you look at the plugin page for the Markdown plugin, it shows several screenshots. There is one that demonstrates that you can expect two tabs at the bottom of your *.md file. One for text editing and one for preview. I only see the text editing tab, not the preview tab. What did change after installing the plugin was the highlighting of the file in the editor tab. This is as expected. However, I was looking for the preview. 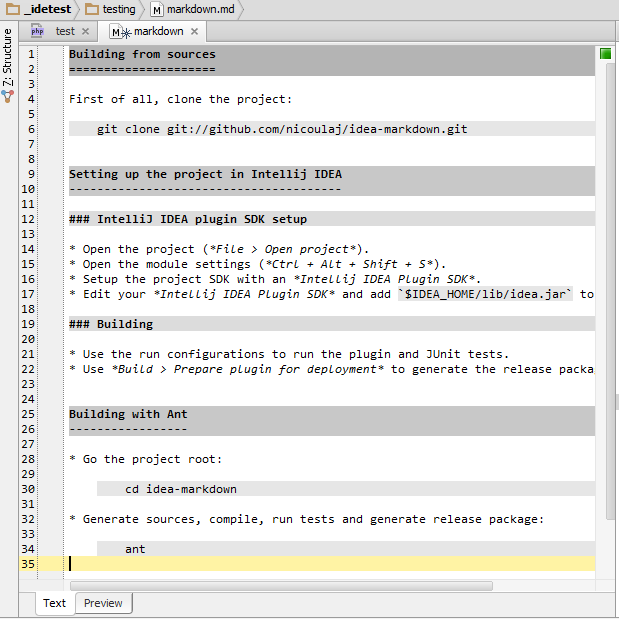 I would not like to purchase yet another editor just for Markdown. Any help appreciated. I will try on windows. The question originated on a Mac. [Edit] On windows, it's exactly the same as on the Mac: no preview tab, but my build is older than yours. Anyone knows if I can turn the preview tab 'on' somewhere? Tried it, but with no difference... Clean installation of EAP version, option for Markdown plugin accessible and working, but no preview tab. Finally found a hint. There was something with my editor pane layout. 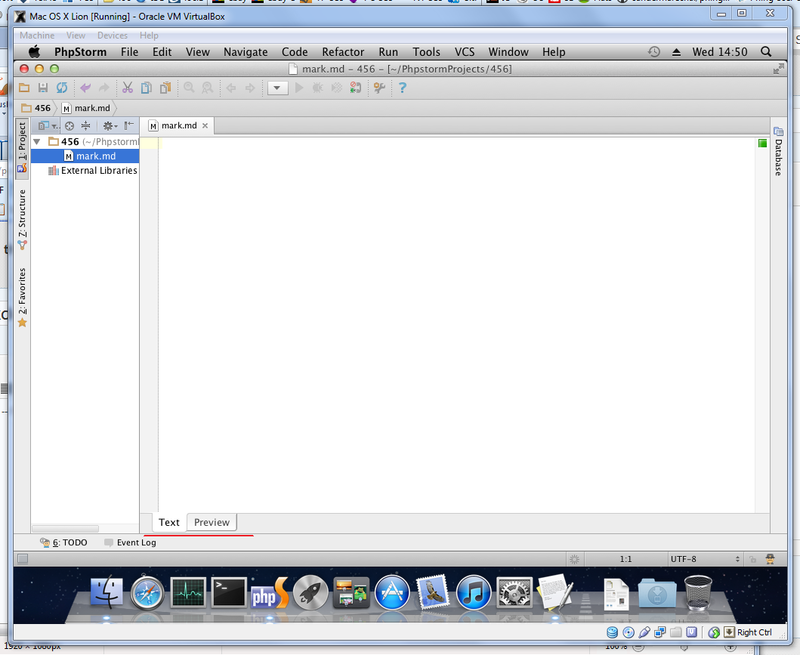 When I tried split mode (which I don't want) then I get the tabs in the right pane. I suddenly realized I wasn't seeing *any* tabs, not even the text tab. So everything was working, I just couldn't get the right panel layout. After clicking 'unsplit' the tabs remained! Brilliant, Bart. So the solution is to enable split view once, close the bugged split view, and then it keeps working (even after restarting). They have built in Markdown support today I think, I switched to that. The one built in now is the one which has this bug. Ah, I wasn't aware of that. It never stopped working after my workaround. Split view revealed the desired preview panel on new view. So I just closed the editor without the preview. I was using the build-in markdown plugin. Had the same issue. The problem was that intellij detected my README.md file and automatically isntalled two different markdown plugins which didn't work both at the same time. When I restarted intellij I got the errormessage about this and was able to choose which one I want to use. After that I hat to close my README.md file in the editor and restart Intellij again. Then I opened the README.mg file and the markdown plugin was working perfectly fine.